A new study reveals children who are habitually barefoot show significantly different motor skills between the ages of 6-10 than those who are habitually shod. Researchers report those who habitually barefoot have better balance and jumping skills. A new study reports people living in areas with more sunlight have lower rates of OCD. Neuroscientists at the University of California-Berkeley are developing a technique that could give us the ability to fool our brain into thinking that we’d experienced something that never happened by manipulating electrical activity in the brain. Researchers report boys on the autism spectrum tend to have lower fractal dimension in the right side of the cerebellum than those without autism. Distinct molecular mechanisms can generate the same features in different neurons, a team of scientists has discovered. Its findings, which appear in the journal Cell, enhance our understanding of brain cell development. Finally this week, a new study reports a short burst of exercise can dramatically improve long-term retention of new motor skills. Researchers say those who can improvise are better musicians than those who have limited improvisational experience. Melatonin is a hormone known to promote sleep, but its underlying mechanisms are unknown. Now, researchers have discovered how melatonin suppresses neurons in the brain that keeps you awake and alert. These findings could lead to new therapies for those who suffer from insomnia. A new study shows how specific neurons can process sensory information about temperature and facilitate a change in behavior to adapt to the climate. Researchers have identified electrical activity in the brain that is specific to the start of migraines. The new study reports spreading depolarization can be seen as a migraine begins, and an electrical current can be used to stop it in its tracks. Adolescent drinking is associated with changes in the metabolite profile, a new study shows. Scientists are using big data and artificial intelligence to map neural networks in the brain. The new technology could help to better understand the progression of neurodegenerative diseases. Sound and object motion can be used to change perceptions about body size, according to a new study. Researchers report impairments in the neuroprotective communication between neural blood vessels, astrocytes and neurons may be an early factor in how high blood pressure may impair cognitive function. A new study confirms a link between a number of autoimmune diseases and an increased risk of developing psychosis. Autonomous Sensory Meridian Response (ASMR) – the relaxing ‘brain tingles’ experienced by some people in response to specific triggers, such as whispering, tapping and slow hand movements – may have benefits for both mental and physical health, according to new research. Researchers have developed new neural implants that enable targeted delivery of drugs deep into brain structures. A new study reports specific alterations in signaling circuits associated with memory can induce an abnormal response in neurons, which is linked to the aging process and cognitive decline. Researchers say the combination of low muscle mass and strength in the context of high-fat mass, could be a predictor of cognitive function in older adults. Finally, this week, a new study reports a mother’s diet during pregnancy may have an effect on the composition of her child’s gut bacteria. AI research has come full circle, helping neuroscientist better understand how the human brain works, researchers say. Babies removed from their mothers for 24 hours when they were 9 days old exhibited significant behavioral and brain structural abnormalities in adulthood, a new study reports. Researchers noted memory impairment and less communication between specific brain regions in those removed from maternal care. Researchers have identified three genes linked to hemiplegic migraine. People whose negative emotional responses to stress carry over to the following day are more likely to report health problems and physical limitations later in life compared with peers who are able to “let it go,” according to findings published in Psychological Science. Using electrical fields to simulate slow wave sleep, researchers enhance memory. A new study has identified a link between visual processing problems and an increased risk of developing a mental health disorder. The study reports the risk for mental illness increases when the visual cortex has difficulty communicating with networks associated with focus and introspection. According to researchers, dopamine neurons may play a key role in the formation of episodic memory. The findings could help in the development of new treatments for neurodegenerative disorders that affect memory. A new study reveals up to 25% of rhythmic genes lose their biological rhythm following a 4-day night shift simulation. Damage to some of the pathways that carry information throughout the brain may be responsible for attention deficit in patients who have had a subcortical stroke in the brain’s right hemisphere, according to a study published online in the journal Radiology. Researchers hope the findings may provide a measure for selecting suitable patients for early interventions aimed at reducing cognitive decline following a stroke. Finally this week, a new machine learning study has revealed a novel combination of factors that can increase a person’s risk of developing dementia. A new study provides the first direct evidence that within each person, smell sensitivity varies over the course of each day. The pattern, according to the data, tracks with the body’s internal day-night cycle, or circadian rhythm. Researchers have revealed the neural signatures for explicit and implicit learning. Neuroscientists have discovered precisely where and how to electrically stimulate the human brain to enhance people’s recollection of distinct memories. People with epilepsy who received low-current electrical pulses showed a significant improvement in their ability to recognize specific faces and ignore similar ones. Adults likely do not develop ADHD, according to new research. Researchers propose a new theory of memory formation, reporting memory storage does not rely on the strengthening of connection between memory cells, but on the pattern of connections that form within the first few minutes of an event. A new Finnish study shows that individual circadian preference is associated with brain activity patterns during the night. According to researchers, the size, shape and number of dendritic spines in the brain may determine whether a person develops Alzheimer’s disease. Finally this week, migraine triggers can increase oxidative stress, a new study reports. Targeting oxidative stress may help to prevent migraines. A new study reveals people showed improvements in auditory memory when transcranial magnetic stimulation was applied. The part of the brain that creates mental maps of one’s environment plays a much broader role in memory and learning than was previously thought, according to new research published this week in the journal Nature by researchers at Princeton University. Researchers have developed new tests to help quantify automatic moral and empathetic judgement. Neurons in the prefrontal cortex “teach” neurons in the hippocampus to “learn” rules that distinguish memory-based predictions in otherwise identical situations, suggesting that learning in the present helps guide learning in the future, according to research conducted at the Icahn School of Medicine at Mount Sinai and published April 5 in the journal Neuron. Neuroimaging technology can help determine the success of failure possibilities of cochlear implants for those who lose their hearing during adulthood. Scientists have known that a lack of sleep can interfere with the ability to learn and make memories. Now, a group of researchers have found how sleep deprivation affects memory-making in the brain. Reducing stress in those with epilepsy may be a beneficial, low risk preventative treatment for seizures, researchers report. Using PET scans of the brain, researchers have shown that dopamine falls and fluctuates at different times during a migraine headache. MRIs show a brain anomaly in nearly 70 percent of babies at high risk of developing the condition who go on to be diagnosed, laying the groundwork for a predictive aid for pediatricians and the search for a potential treatment. A new study reports the anterior cingulate cortex, an area of the brain associated with empathy, activates very weakly in people with autism. Scientists at Max Planck Florida Institute for Neuroscience developed a light-sensitive technique to visualize and manipulate neuromodulation with unprecedented spatial and temporal precision. Finally this weekk, new research indicates that some autobiographical memories are more vulnerable to Alzheimer’s disease and dementia than others. This infographic provides a quick overview of headache disorders which are the most common neurological disorder affecting many of us. If you are interested in learning more about migraine headaches then check out my three-part series on migraine attacks. Welcome to Part Three of this series on migraine attacks. Today, I am stepping into the world of guest blogging and am delighted to host Inside The Brain’s first guest blogger – Dr Chad Beyer, who explains how the race is on to discover better and safer drugs to diminish migraine pain and prevent future attacks. If you belong to the 1 in 4 households in theUnited States or the 11% of the world who suffer from acute migraines, you have about a 50/50 chance of being prescribed a “triptan” or a non-steroidal anti-inflammatory drug (NSAID) such as aspirin. Unfortunately for patients, both treatment options are routinely accompanied by severe safety liabilities. Most people are probably aware of the gastrointestinal and cardiovascular side-effects associated with NSAIDs and selective COX-2 inhibitors – if you are not, just Google Vioxx or Celebrex! Collectively, the triptans (exemplified by sumatriptan) are not a squeaky clean class of molecules either and bring with them potential cardiovascular liabilities that make them contraindicated in roughly 20% of migraineurs who are also diagnosed with high blood pressure, angina and several other cardiovascular-related events. This is due to the non-specific vasoconstriction induced by triptans – which is great in the middle cerebral and meningeal arteries where migraines are suspected to occur but notsomuch in other arteries within the cardiovascular, pulmonary and renal systems. Therefore, despite the marked advances in our understanding of the complex biology of migraines (i.e., the vasoconstriction and neuropeptide (CGRP) hypotheses) and the discovery of a variety of prescription medicines used to manage the clinical symptoms (the triptans), there remain considerable unmet needs requiring a focused eye towards improving both the efficacy and safety profile of future migraine treatments. Although commercially-available triptans only work in about 40% of migraine patients, they continue to be the market leader used to combat migraine. My opinion is that not all migraines are created equal and if you have found a treatment strategy (e.g., a triptan) that works well for you and one that you can tolerate – then by all means, keep doing what you are doing! However, there is clear evidence that exists to support the discovery and development of therapies designed to work by a novel mechanism to treat migraine. We (and other companies focused on this problem) are excited about the possibility to bring to the world a novel medication that demonstrates superior safety and possibly efficacy for the millions of patients suffering from acute migraine. To find out more about our treatment approach for migraine and our company, please visit arielpharma.com to learn more. Scientists have learned a lot in recent years about what happens in the brain to explain the throbbing pain, nausea, heightened sensitivity to light or sound felt during a migraine headache, and the mysterious ‘aura’ that both doctors and scientists use to describe the telltale period, starting up to an hour before a migraine attack, when a person sees dots, wavy lines, flashing lights, blind spots or difficulty with speech, sensation, or movement. Although researchers don’t understand exactly what triggers migraine attacks, they do know that certain foods, lack of sleep, changes in weather, and even stress can trigger a migraine attack in 1 in 200 people. Neuroscientists now see migraine as firstly a disturbance in nerve function rather than a disorder of the brain’s blood vessels. 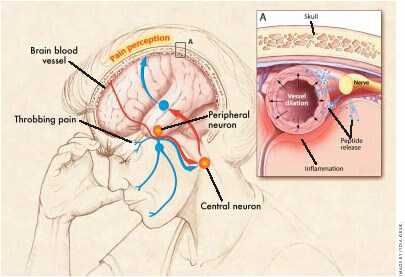 It is believed that in most patients, a wave of electrical activity passing through a major nerve that collects and transmits signals to the face – the trigeminal nerve – and stimulates the release of chemicals such as CGRP and other substances that cause inflammation, makes the nerves more sensitive to pain, and causes blood vessels near the brain to expand (dilate). This nerve irritation often progresses as an electrical wave from the skin to nerves located centrally in the brain. The key to treatment is to act quickly to stop the irritation spreading. In fact anti-migraine drugs can offer relief only in the earlier stages of the attack, but not later, when the pain neurons in the brain have become sensitized. For this reason patients are advised to take medication within 20 minutes of an attack and while migraine pain is still mild. A migraine attack is triggered when a wave of electrical activity which starts in the trigeminal nerve on the side of the face enters the brain and ripples across the surface of the brain. In fact, researchers have been able to demonstrate a possible link between this wave and the experience of ‘aura’ particularly as it spreads across the visual part of the brain. Several drugs used to prevent migraine attacks work by preventing this wave from spreading. Click on the National Headache Foundation website (www.headaches.org) for additional information. In an upcoming post, prominent migraine research scientist Dr. Chad Beyer will explain how the race is on to discover better and safer drugs to diminish migraine pain and prevent future attacks.